Black Highlight 2016 out of the first breeding year from Oldenburger champion stallion Morricone ! Gorgeous black Oldenburger premium filly by Morricone/Jazzman/ (famous Waldhexe dam line), out of Grand Prix and premium dam, ideal for taler dressage rider and breeder . This elegant young mare has very long legs, a great character and the quality to be a championship winner! Her talent and pedigree make her a contender for the top sport circuit and prepare her for a career as a fantastic brood mare. Sire Morricone was Oldenburger champion stallion and shows 2016 a wonderful first year with his offsprings. Actuell 2017 he is qualificated for the German horse championship. Her grandsire, Jazzman, further enhances this remarkable dressage pedigree. 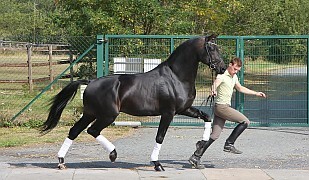 This impressive, dark bay stallion, who was a successful dressage champion up to S-level, is in the top 15 % of the German breeding list and one of the breeding index highest sons of the Dutch top sire Jazz. Her dam, granddam and great-granddam are all elite mares. All foals out of this dam line are premium foals and all her sisters are state premium and elite mares. Brother was nominated for the Oldenburger auction and stallion candidate. 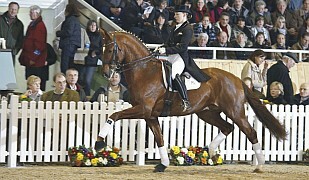 Other brother is sold over the auction for high price to Spain and was there in the final of the spain stallion championship. 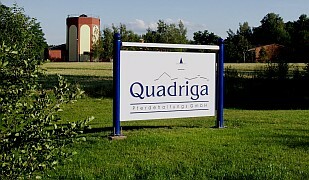 Next brother is winner qualification german horse championship by the 6 years old dressage horse and now successful in PSG . Brother to her dam is licensed breeding stallion and now on the way to Grand Prix. 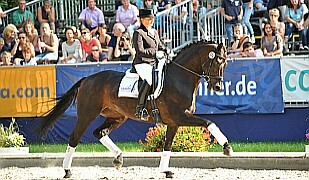 Sister is Grand Prix mare in in 2016 on the long list for the Olympic games. Other sister is qualificated for the german horse championship 2016 by the 5 years old dressage horse. 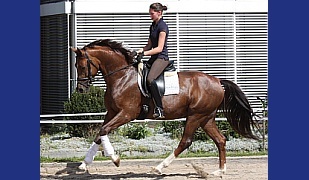 Her granddam is the great mare Cosmopolitan, who is a stallion mother, winner of the championship in Oldenburg and placed high as a finalist in the German Horse Championship. 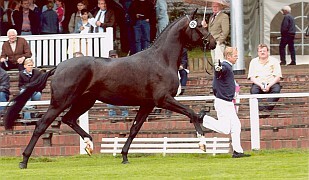 Her great-grand dam is a 3 times stallion mother and all her foals successfully competed at the highest dressage levels. The stunnningly beautiful filly comes with an exceptional pedigree destined for success in dressage and breeding !